Doctor Neha: Oh, thank you. It’s been such a delight. Courtney got me to go to a yoga class, which was lovely. So tell me, Courtney, what’s been on your mind? What are you curious about? Courtney: So when we were at lunch, I asked what your writing process is, which is a vague question. There are a lot of pieces to that. I asked because I’m in the process of sharing my story and so I have my way of doing things. Doctor Neha: That’s Julia Cameron. Courtney: So grateful for her—she opened me up to writing and the creative process. Courtney: …Amazing books that help change the world. I haven’t read it yet, but clarifying communication is so needed in this world. So thank you for doing that work. Doctor Neha: Oh, you are so welcome. So this is a big question for a lot of people. I’ll tell you that in the acknowledgements of my book, I wrote, “It looks like I wrote a book, but pretty much this book wrote me.” Writing a book is a healing process. I think it’s cathartic. I had to learn that even though there were many stories I was really attached to, they weren’t all going to make it into the book. Those stories are the ones you save for your blogs. Those are for the next book. So when that happens, don’t worry, those stories are not gone. Doctor Neha: They’re just not going to be in the structure of this book. They don’t fit in this book, but you can use them in other ways. That’s the first thing I’d tell you. The second one is I like your morning pages routine; it seems to be working for you. Courtney: Yes it gets out ideas so I’m not second-guessing myself. Doctor Neha: So it gets you out of your own way. Courtney: It gets me out of my own way, and I’m super honest and using words that might offend people. Doctor Neha: This is your first draft. That’s okay. Just keep going. That’s it. Are you a blogging or are you a kind of getting a following of people that you’re maybe giving away some lessons because you’re a coach and a fitness trainer? The first thing you want to do is build a platform. Okay? We don’t have bookstores anymore, so you are your own bookstore. So you want to give people valuable content—and give it away free. You want to set up your social media so that you can get their emails. Even though email seems a little ancient, it’s the way that you can directly connect to people. Whereas platforms like Facebook they only see your feed. Instagram is really big—there are all sorts of ways, but you want to create a newsletter or a blog that goes to email. So that during the process, people start to get excited as you give away fun tips and experiences of your journey. Now they’ll be bought into it. So when the book comes out, they’ll want it. Courtney: I have a beautiful Instagram that I really like. I love posting on my Instagram—Body Journey by Courtney. Courtney: But that’s fitness related and I want to come across as professional there. This book that I’m writing is very different. It is very personal. How do I mesh the two? Doctor Neha: Start by helping them—in a real way—so they know you’re legit. Give away information. Make it real. Make it solid. Make it good. Engage with them. Let them get to know you before you do this big reveal right of things that are personal. This time I’m here in Bali with a coaching friend of 10 years ago, Amy, because she followed me on my video blogs and saw me coming to Bali. She told me, “I like your work, but I loved that you went to Bali every year.” So I said to her this year, “Do you want to come with?” So there’s a way that once people really like you and trust you, you can show more of yourself. And you’ve got to be comfortable with that. You’ve got to trust it. I have to tell you for that my book is personal. It’s not a regular doctor book where I just write about other people’s experiences and patients. I have practical tools about communication, and I talk about how my inability to communicate manifested in throat constriction and all sorts of things. I also wrote about things that happened with my dad’s temper, my sister’s anxiety. So three months before the book was launching, I didn’t sleep. I was getting nervous because, once it was out there, it was out there. Doctor Neha: Part of this writing process is about preparing you. It’s about your healing. It will heal you in the process so trust it. I’d also tell you some practical tips. One question you asked at the beginning is about what is my process? My process is I need to talk it out. So I get on a video conferencing app with my editor, and she helps me with structure. I answer questions and talk out my ideas. When she asks me a question such as, “How is this connected to that?” I say, “Oh it’s connected because…” and we both start typing in the same document while I talk it out. Now that gets pretty expensive, so what I ended up doing now is finding a good friend or my assistant whom I can talk things out and do that work ahead of time. Then my editor can read through what I wrote and she structures it and follows up with good questions that help me put it together. The next thing I’d tell you is once you have it all down, get a really good editor to work with you to help put structure to it. Courtney: Ah, yes. I put pressure on myself to say I need to be the one that edits properly. I need to be the one that knows the structure. Doctor Neha: No, you’re the one who had the experience and you’re the one who needs to be able to share it. Courtney: Beautiful. I love that. Doctor Neha: I’m going to do a plug here. When I got my book deal, because I didn’t have a social media platform at the time, my publishing house sent me a book called Platform. It’s really simple although sometimes it seems overwhelming because you see how many things they want you to do to (set everything up for a platform, but it is very concrete and tells you what to do for a platform. Doctor Neha: Then the reason I’m in Bali is because of this beautiful editor named Kelly Notaras. She was doing a writing retreat out here, and she just published a book called The Book You Were Born To Write. I have just started reading it, but she is thorough. She is experienced. She is really good. I would say Julia Cameron’s morning pages are phenomenal, and her book is called The Artist’s Way. And there are morning journaling pages that you do as a stream of consciousness writing every morning. Courtney: Yes, huge game changer. Doctor Neha: Well, that’s a good start. What do you think now? Courtney: Okay. Last question. How do you discipline your time? Doctor Neha: I thought you set a timer for two hours for yourself? Courtney: I only do it on some days. Do you give yourself a Monday through Friday schedule or a Monday, Wednesday, Friday or…? Doctor Neha: I wish I were more structured. What I do is something like come to Bali for a month and bring someone with me. Then I work about two to four hours a day. I guess I become more disciplined when I feel supported. 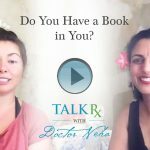 Doctor Neha: So ask yourself what can you do to support yourself? You don’t have to like punish yourself to do this. Courtney: Bless you for saying that. Doctor Neha: That’s what I would start thinking about. Doctor Neha: How do I support myself in a way that writing is joyful and healing for me? Courtney: Every one of you out there. Doctor Neha: I am so proud of you for embarking on it. Thank you. It’s a huge and beautiful gift to not only give yourself to heal, but also to share in the world. It’s a courageous act. Courtney: It feels very healing already. Doctor Neha: The other thing I’d tell you is to make it as simple as you can. Simple and clear is what the reader wants. Okay? Doctor Neha: Okay. 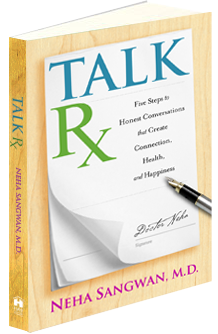 I’m going to give to you a copy of TalkRx because you are open. You were just willing to share with everyone and, and I hope inspire them to get working on that book. Courtney: Yes, I hope so too. Doctor Neha: All right, everybody, until next time, signing off from Bali.